limedragon :) » Blog Archive » Socks, ghosts, and links, oh my! For a while, I was working on my current SOS08 pair, Big Basin (from Six Sox Knitalong). This is the first time I’m using a wool-tencel blend and I just love it (Zen Yarn Garden Tencelicious)! Meanwhile, as mentioned in my last post, I had a sock yarn purchase token ready for my trip to Depth of Field. Surprise! I didn’t get any yarn, but I ended up getting New Pathways for Sock Knitters instead. 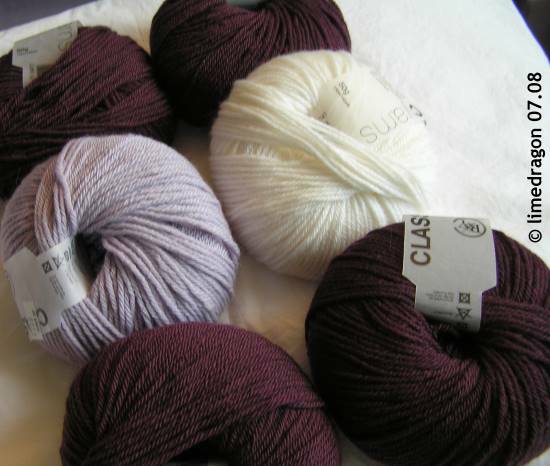 Nevertheless, I was still able to use the token, as on Plurk, I wished for some sock yarn inspired by Randall’s Ghost (webcomic), mostly black with bits of white. KnittingDragon of Cables & Lace came to the rescue! In other knitting news, Opal of The Akamai Knitter has opened an Etsy shop selling her handspun and handmade stitch markers. I couldn’t resist a set with a dragon charm (similar to this one), so cute! I didn’t realize the yarn credits applied to books as well. But hey, I guess that’s just more inspiration to use up more yarn for the next credit; right? The black and bit ‘o white looks great. I saw it when it was born on plurk too! 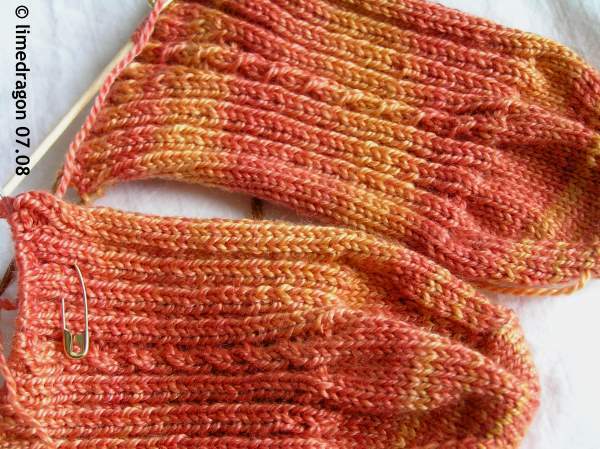 The Big Basin socks are on my summer list – I think I have some of that Tencel in the stash, I may to dig it out! The black with white is very intriguing! Hopefully it’s near the top of your too-knit list? ;) Love your Big Basin socks, too. Nice socks! 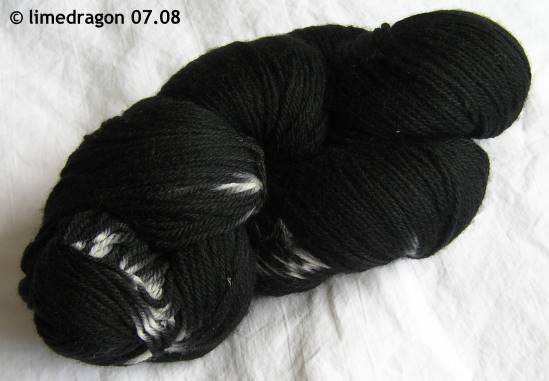 The black with white yarn looks very inviting in the skein. Can’t wait to see it knit up. Beautiful socks. I really like the yarn you bought. The bunny sweater is going to be really cute. Cashsoft yarn is of so soft. I like the black yarn with bits of white. I’m looking forward to seeing it knit up. The Big Basin socks are looking good too.